A brief explanation of how cannabis ripens will highlight reasons why Boveda is essential during the curing process of cannabis flowers. Trichome is the name given to the mushroom shaped structure made of cannabinoids commonly referred as “crystals,” covering the interior and exterior of a cannabis flower. 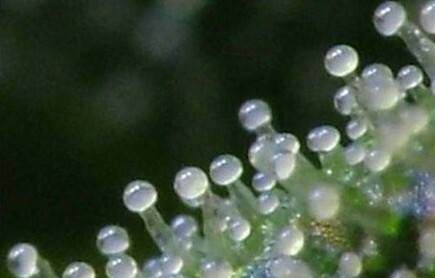 As you can see in the pic the Trichomes are transparent. As the trichomes age, they turn from transparent to a milky. 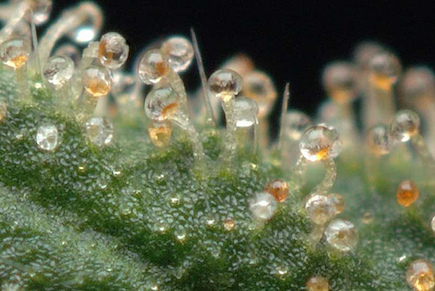 In the final stage, the top of the trichomes start to turn from a milky color to a transparent amber. The amber color is not a complex cannabinoid such as THC (Tetrahydrocannabinol) or CBD (Cannabidiol). It is a Cannabinol metabolite of complex cannabinoids. Cannabinol has diminished psychoactive properties and has a “harsh” taste when inhaled. Most people will sacrifice some CBN (cannabinol) development for additional trichome development. This is very difficult because the Trichomes and the cannabis flower itself ripen at different rates. Problems occur because your Trichomes don’t stop ripening as your flower is drying. One of the major factors in degradation of trichomes during the drying process is the moisture content of the flower. 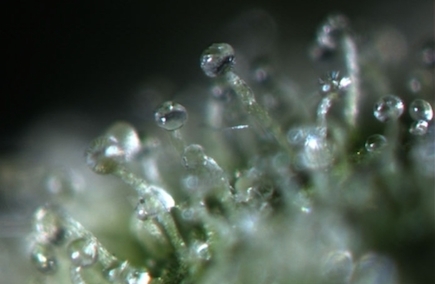 As the flower drys, trichome ripening occurs until you reach a .6 aw (stands for water vapor activity which is water vapor pressure of the flower divided by pure water vapor pressure at the same temperature). So, ideally, you pick the flower, then dry it until .6 aw, storing it in a water vapor impermeable container. The problem occurs commonly in dense flowers. The outer edge of a dense flower dries to .6 aw (equivalent to nearly 62%RH) much quicker than the core of the flower. So, as a result, most people do an activity called burping. Burping is taking these partly dried flowers and putting them in a closed container for a period of time, then opening the container for a duration, repeating the process until flowers reach .6 aw. The idea is you are wicking the moisture from the core to the exterior of the flower. The problem is you are allowing all but the core of the flower’s trichomes to over ripen. If only there was a better way! 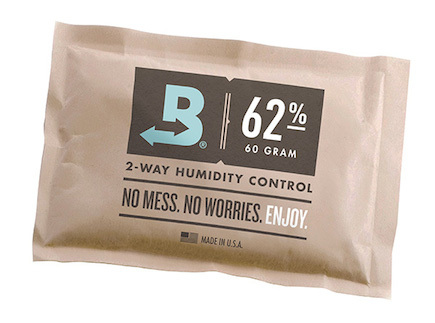 The solution is BOVEDA 2-way humidification packs. Boveda packs replace the act of “burping,” allowing the entire (exterior to the core) flower to be properly dried without over drying one area. This arrests CBN (cannabinol) development, making a more potent flower.